With Telestream ScreenFlow for Mac screencasting software, you can capture the contents of your entire monitor at the same time as you capture your video camera, microphone and computer's audio on Mac OS X. ScreenFlow for Mac is simple but powerful editing tools enable you to create incredible screencasts in no time. The finished result is a QuickTime or Windows Media movie, Publish directly to YouTube, Full range of elegant 2D & 3D transitions. * New Flash Publish feature. ScreenFlow for Mac can now create an all-in-one Flash video presentation, ready for easy upload straight to your website. The HTML, video and Flash player component are automatically created by ScreenFlow in a single step. *64-bit support for audio capture. 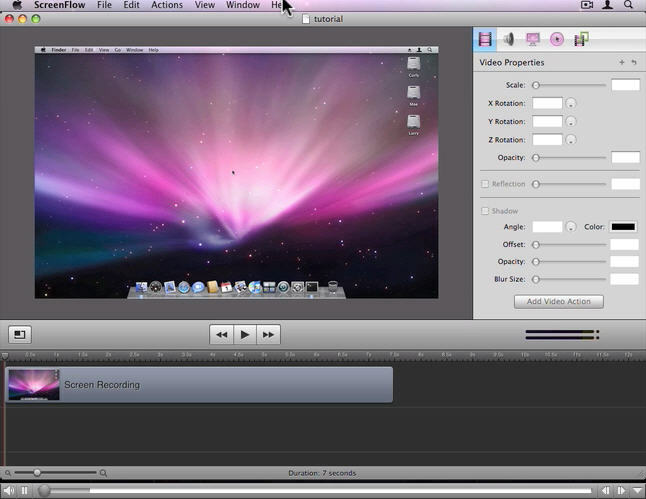 The audio driver used by ScreenFlow to capture system audio will now run on 64-bit Snow Leopard kernels. Qweas is providing links to ScreenFlow for Mac 3.0 as a courtesy, and makes no representations regarding ScreenFlow for Mac or any other applications or any information related thereto. Any questions, complaints or claims regarding this application ScreenFlow for Mac 3.0 must be directed to the appropriate software vendor. You may click the publisher link of ScreenFlow for Mac on the top of this page to get more details about the vendor.